Kolomoisky wants relief from prosecution by the Ukrainian courts and the National Bank of Ukraine (NBU) for theft, fraud and unjust enrichment of $1,911,877,385 from Privatbank, which Kolomoisky lost control of in a state takeover in December 2016. For the story of the looting of Privatbank, and the diversion of the International Monetary Fund’s Emergency Liquidity Assistance (ElA) loans to the NBU, and from there to Privatbank, read this archive. Ukrainian prosecutors now charge that the NBU-Privatbank money was stolen by a scheme of sham loans from Privatbank to offshore companies Kolomoisky ran for his personal benefit. He claims the money was recycled and returned to the bank. The Ukrainian prosecution resulted in a worldwide freeze of Kolomoisky’s assets ordered by the High Court in London on December 19, 2017. Subsequent rulings by the High Court in January of this year, in February, and on July 24, have tightened control by the courts and the Ukrainian government over Kolomoisky’s business operations. Together with the assets of Gennady Bogolyubov, Kolomoisky’s shareholding partner in Privatbank, the High Court has frozen a total in asset value of $2.6 billion. In last week’s High Court judgement, Kolomoisky was allowed to continue making payments of some inter-company loan debts; the charges of his lawyers; and $250,000 per month for flying on board his personal aircraft. Tymoshenko wants Kolomoisky’s financial backing for her campaign to win the Ukrainian presidency from Petro Poroshenko and other challengers in the election scheduled in eight months’ time, on March 31, 2019. With most of her support from Galicia in western Ukraine, Tymoshenko is the front-runner in the most recent Ukrainian poll with 13.3%. Yury Boyko, whose support comes from Russian-speaking eastern Ukraine, has 8.4%; Poroshenko is running far behind at 7.6%. Delivery of $200 million in fresh arms supplies from the US threatens to intensify the fighting against the Novorussian regions of Donetsk and Lugansk. This in turn would help Poroshenko, if the arms are not used and Ukrainian forces not defeated on the battlefield.If there is a military victory, Poroshenko will gain; if a defeat, Tymoshenko will gain. She will also capitalize if Poroshenko were to accept President Vladimir Putin’s proposal for a new referendum in the Donbass. Tymoshenko has long been the Ukrainian politician preferred by the German Chancellor, Angela Merkel. For the story of the Merkel-Tymoshenko alliance, read this. Polish sources believe the Warsaw meeting between Kolomoisky and Tymoshenko was leaked by the German government to the Berlin-based Axel Springer media group, which passed on the information to Onet, the online Polish portal which Springer owns. Onet may have been cribbing from another source, a Ukrainian Facebook blogger named Bohdan Kuzmych. 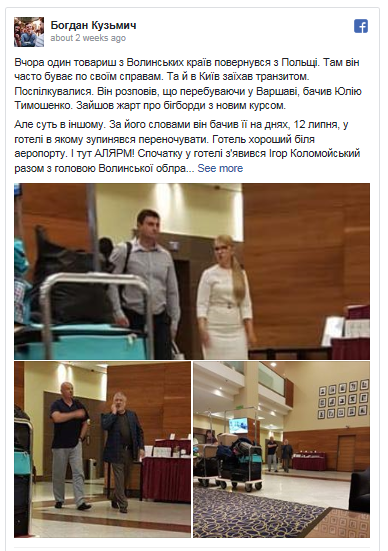 Overnight between July 13 and 14, he posted a report claiming that a friend of his from Volyn region (in Galicia, on the border between Poland and Ukraine) had spotted the head of the Volyn region parliament, Ihor Palytsia, on July 12 at a hotel near Warsaw airport. Palytsia was photographed by the source with Kolomoisky in the hotel lobby. In the same lobby fifteen minutes later, according to Kuzmych, his source spotted and photographed Tymoshenko with an unidentified man. The hotel is reported to have been the Courtyard Marriott. The Kuzmych report doesn’t say Kolomoisky and Tymoshenko met, but hints they had. The Ukrainian and Russia media, which picked up the reported sightings, claim they did meet. Kolomoisky and Tymoshenko have had many fallings-out in the past. “God forbid this devil in a skirt will come to power!” Kolomoisky announced in 2016. Now he is backing her as the candidate most capable of beating Poroshenko. According to Ukrainian political analysts quoted in the RT story, the political reconciliation between Tymoshenko and Kolomoisky has long been known; and the rewards each seeks from the other no surprise. Polish political analyst and reporter Stanislas Balcerac has investigated Kolomoisky’s Polish business. “He has extensive interests in ferroalloys in Poland, as well as aviation. Some of his Dniproavia planes are still stored at Katowice airport.” Balcerac suspects that when Kolomoisky was operating the Ukrainian Aviation Group (Dniproavia, Aerosvit, Donbassaero) with a near-monopoly of commercial civil aviation in Ukraine, he wanted to take over the Polish national airline LOT on the cheap”. The LOT attempt was reported here; the collapse into bankruptcy of Kolomoisky’s airline companies here. 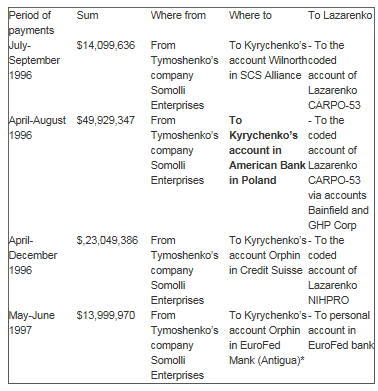 Balcerac has also tabulated evidence that corrupt payments Tymoshenko made to former Ukrainian prime minister Pavel Lazarenko went through Poland. The evidence was assembled by US prosecutors and presented in an indictment of July 2001; note that one of the prosecutors then was Robert Mueller, currently the special persecutor of President Donald Trump and the Russian Government. Lazarenko was convicted and jailed. Read the US evidence against Tymoshenko in the section titled “UESU Frauds” at page 8 of the indictment. For a brief summary of the very long story of Tymoshenko’s corruption, read this. For details uncovered by Balcerac of the use of Polish go-betweens in these corrupt schemes, read this.